Not one regret, but plenty of love. Gypsy brewer Brian Strumke of Stillwater Artisanal Ales and Ted Stelzenmuller, chef and co-owner of Jack’s Bistro in Canton have come together to open one of my most favorite new bars in a long, long time – Of Love & Regret in Brewers Hill.Between the amazing beers (13 by Stillwater alone) and a smallish but carefully crafted food menu, they’ve created a fabulous, yet casual gathering spot. The place feels sorta European – tables close together, friendly servers and no televisions. The beer. That’s what initially draws you to this place. I first learned about Brian and Stillwater from my friend Jed at The Wine Source. Stateside Saison and Cellar Door were the first ones I tried. Love them. 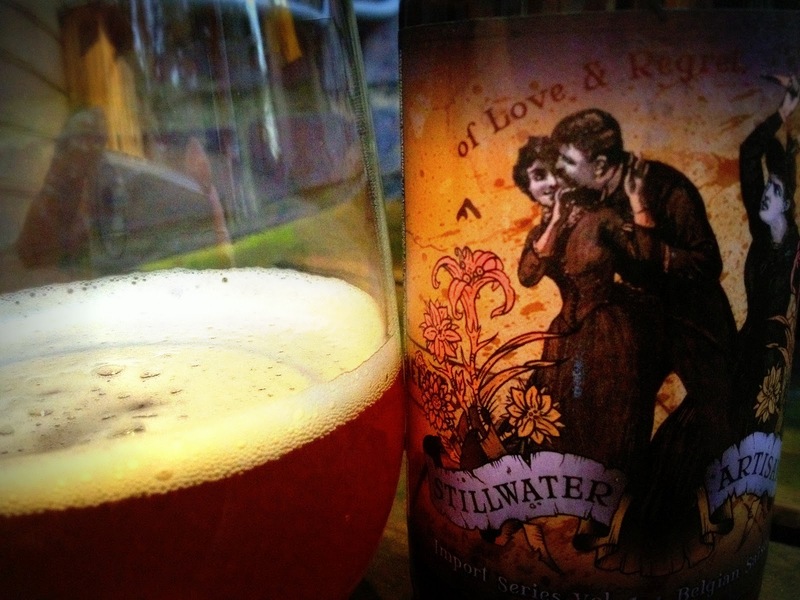 And then, I tasted my favorite of his beers, Of Love & Regret. It’s different…a little more aromatic with distinct flavors of herbs and spices. It’s not always available, but when they do have it at The Wine Source, I grab a few bottles. Nice to have your favorite beer on hand, don’t you think? Special treat. 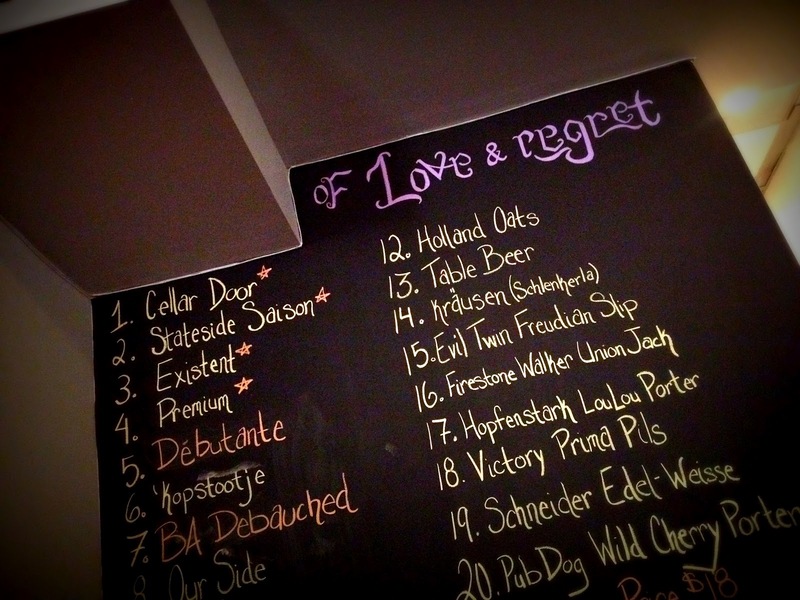 So, as you can guess, at Of Love & Regret, you’re not gonna see Miller Lite on the menu. You must know that going in. (And I’m all for it.) 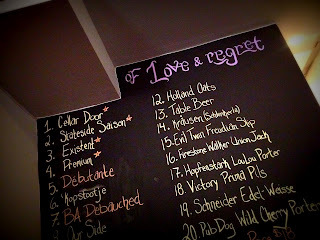 We each started with our own small draft – Cellar Door, Existent, Debutante and Kopstooje while we waited for our table for about 20 minutes (not bad at all for opening night). 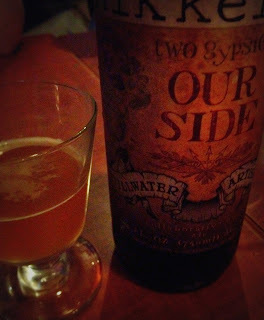 Then with dinner, we shared a pitcher of Stateside Saison and a bottle of Our Side, the collaborative brew by Stillwater/Mikkeller. We loved them all. Be sure to try lots of different beers when you go! And then there’s the food. 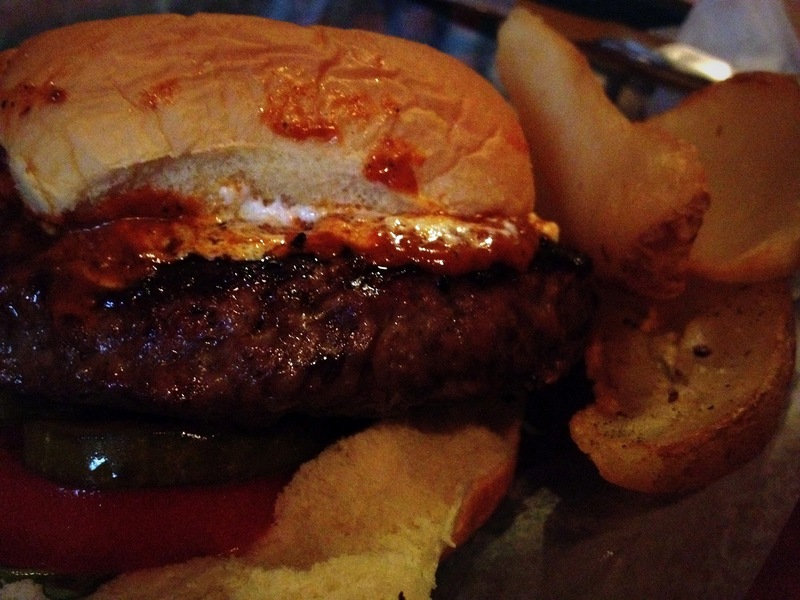 I had the Berber Burger: Moroccan spiced rubbed natural beef with goat cheese, wilted arugula, Moroccan tomato ketchup and sweet pickles. (See photo below…yum.) It is such a creative and tasty burger. Way to go, Ted. One of my friends had the French Burger: brie cheese, brandy poached pear, grilled onions and bacon. My other friend had what I think I might get when I go back, the Grilled Cheese: house smoked tomato, cheddar cheese, smoked gouda, brie and grilled scallions. I’m not always a fan of super fancy grilled cheese sammies, but this was ridiculously good. Also need to give a shout out for the fries – wide cut, soft inside, slightly crispy out. Perfect. We were told that the Smokey Burger should be on our list for next time. It’s topped with slow roasted pulled pork, smoked gouda, smoked bacon and sweet & spicy pickles. Sold! One appetizer I’d like to try next time: Crispy pig ears – grilled red peppers, grilled onions, lime, cilantro, jalapeno, poached egg and toasted garlic. Holy dirt. So, go. Run, actually. Probably the best experience and meal I’ve had at such a new place. From the food to the service to the vibe – fantastic. Congratulations, Brian, Ted and your hard-working staff. You did it.